This is the eighteenth in a series of chimerical creatures; the aim is to create an alphabet of fabulous beasts over the coming months. In Norse mythology, Ratatoskr (Old Norse, generally considered to mean “drill-tooth”or “bore-tooth”) is a squirrel who runs up and down the world tree Yggdrasil to carry messages between the eagle Hræsvelgr, perched atop Yggdrasil, and the wyrm Níðhöggr, who dwells beneath one of the three roots of the tree. Sometimes pictured with a horn on his head, Ratatoskr is attested in the Poetic Edda, compiled in the 13th century from earlier traditional sources, and the Prose Edda, written in the 13th century by Snorri Sturluson. Scholars have proposed theories about the implications of the squirrel. Ratatoskr climbing Yggdrasil. 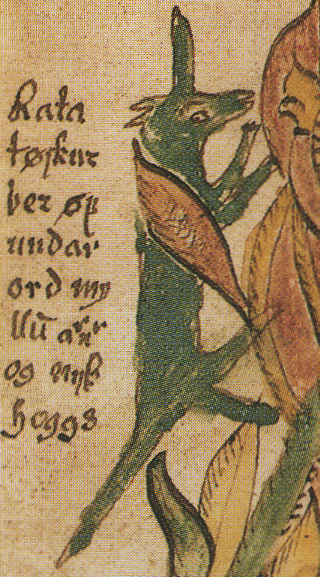 The text by the animal reads “Rata / tøskur / ber øf / undar / ord my / llū arnr / og nyd / hoggs”. From a 17th century Icelandic manuscript now in the care of the Árni Magnússon Institute in Iceland. In the Poetic Edda poem Grímnismál, the god Odin (disguised as Grímnir) says that Ratatoskr runs up and down Yggdrasil bringing messages between the eagle perched atop it and Níðhöggr below it. And tells them to Nithhogg beneath. Richard W. Thorington Jr. and Katie Ferrell theorize that “the role of Ratatosk probably derived from the habit of European tree squirrels (Sciurus vulgaris) to give a scolding alarm call in response to danger. It takes little imagination for you to think that the squirrel is saying nasty things about you.” Modern scholars have accepted this etymology, listing the name Ratatoskr as meaning “drill-tooth” (Jesse Byock, Andy Orchard, Rudolf Simek) or “bore-tooth” (John Lindow). 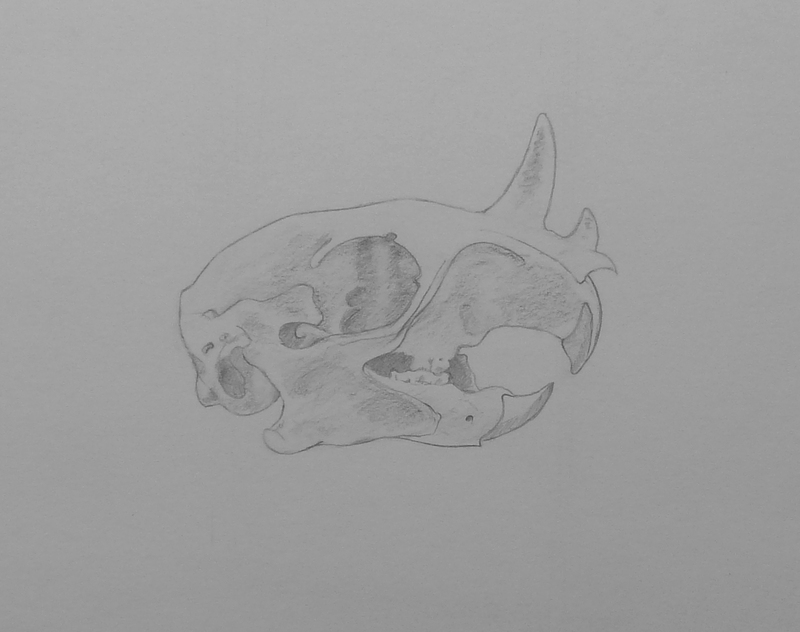 You are currently reading Sketchbook Page 54: R is for Ratatoskr at osteography.